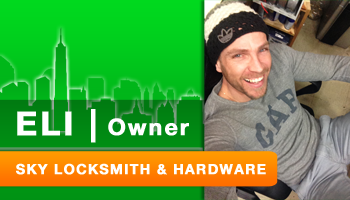 Eli acquired Sky Locksmith & Hardware becoming the new owner in 2012. Since then Eli has transformed business by remodeling the retail space and greatly expanding product inventory for costumers. Along with Sky’s new and improved atmosphere, the company has created a fresh new brand style for an ealily recognizable locksmith, home and hardware staple of the Upper East Side.